SEATTLE, WASHINGTON--(Marketwire - Feb. 2, 2012) - VentriPoint Diagnostics Ltd. (TSX VENTURE:VPT) (PINKSHEETS:VPTDF) has released its latest version of the VMS™ heart analysis system. Over the last year of installing systems, customers have provided invaluable feedback on the operation and use of VMS™, and their suggestions have now been incorporated into version 1.1 of VMS™. "VentriPoint is excited to be releasing this significant user-driven update to the VMS™, said Dr. George Adams, President & CEO of VentriPoint. "This update demonstrates VentriPoint's commitment to the delivery of the best possible heart analysis solution to our customers." 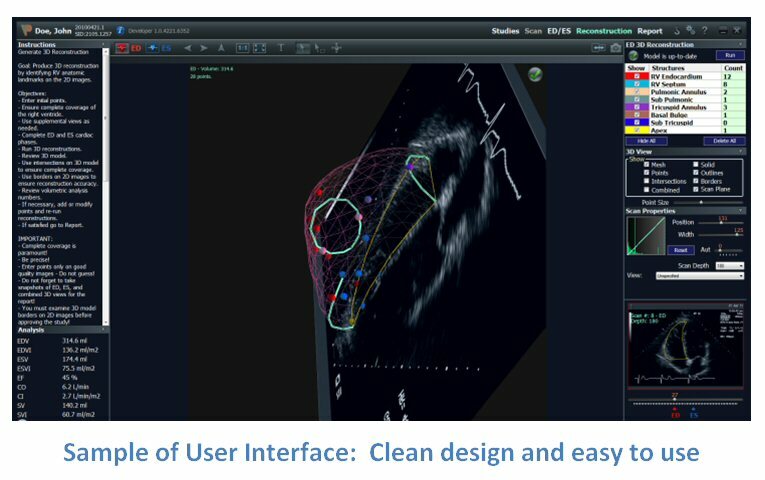 The VMS™ has been updated to interface with the newer digital ultrasound machines and to export VMS™ studies to the standard hospital archiving database, enabling access to the ultrasound images and VMS™ results from anywhere in the hospital. These important features were requested by our current users and make the VMS™ even more attractive as an alternative to MRI. The new version of the VMS™ has passed all final testing and is now available for purchase for clinical use in Europe and Canada, and is available for research purposes in the United States. "The VentriPoint development team has worked hard incorporating requests and updating the software to better address the needs of our clinical users," said Scott Ashley, Vice-President of Research and Development, "The feedback we received was based on features, rather than our user interface. Our customers like the simplicity and ease of use of our VMS™ user interface." "It is a pleasure to show cardiologists how our updated product is better at meeting the needs of their practices. Users find the system easy to use and easy to learn. We have made significant progress in the last year and I envision a strong future for VentriPoint and VentriPoint's product," said Amol Karnick, Vice-president of Sales, Marketing and Business Development. The Company will immediately start installing the newer version in Europe and Canada for clinical use and in the United States for research purposes only. VentriPoint has created a diagnostic ultrasound tool to monitor patients with heart disease, a leading cause of death in developed countries. Management believes the VMS™ is the first cost-effective and accurate diagnostic tool for measuring right ventricle heart function. Congenital heart disease is the first application in a suite of applications for all major heart diseases including pulmonary hypertension, cardiovascular disease and heart failure, which management believes has a multibillion-dollar market potential. Canada and Europe (CE Mark) have granted approval for the sale of VentriPoint's VMS™ heart analysis system and VentriPoint is pursuing the US-FDA approval through the 510(k) process. FORWARD-LOOKING STATEMENTS: The statements made in this press release that are not historical facts contain forward-looking information that involves risk and uncertainties. All statements, other than statements of historical facts, which address VentriPoint's expectations, should be considered forward-looking statements. Such statements are based on management's exercise of business judgment as well as assumptions made by and information currently available to management. When used in this document, the words "may", "will", "anticipate", "believe", "estimate", "expect", "intend" and words of similar import, are intended to identify any forward-looking statements. You should not place undue reliance on these forward-looking statements. These statements reflect a current view of future events and are subject to certain risks and uncertainties as contained in the Corporation's filings with Canadian securities regulatory authorities. Should one or more of these risks or uncertainties materialize, or should underlying assumptions prove incorrect, actual results could differ materially from those anticipated in these forward-looking statements. These forward-looking statements are made as of the date of this press release and, other than as required by applicable securities laws, the Corporation does not assume any obligation to update or revise them to reflect new events or circumstances. Although management believes that expectations are based on reasonable assumptions, no assurance can be given that these expectations will materialize. About this company VentriPoint Diagnostics Ltd.